Rivian has fully uncovered their plans after years of being in stealth mode — last night the electric automaker unveiled their 7-seater luxury SUV ‘R1S’ after their electric pickup truck R1T a day earlier. With their HQ in Plymouth, Michigan, Rivian synchronizes efforts from several locations in the United States and London, UK — according to Rivian CEO RJ Scaringe the company employs around 600 people at the moment. Rivian’s R1S is a direct competitor to the Tesla’s Model X electric SUV which is currently the only luxury electric SUV in production. Rivian’s R1T and R1S front fascias are getting mixed views and reviews from people for their unique design and functionality. Like the R1T pickup truck, Rivian is also offering three different battery packs for the R1S electric SUV i.e. 105 kWh, 135 kWh and 180 kWh (full specs sheet below) that deliver 240+, 310+ and 410+ miles of range respectively. The mid-range R1S (135 kWh/310+ miles) variant delivers the fastest 0-60 mph time of 3 seconds, of course, these results are not yet tested by an independent body, we hope these EVs stand their first real-world test that is ‘going into production’. 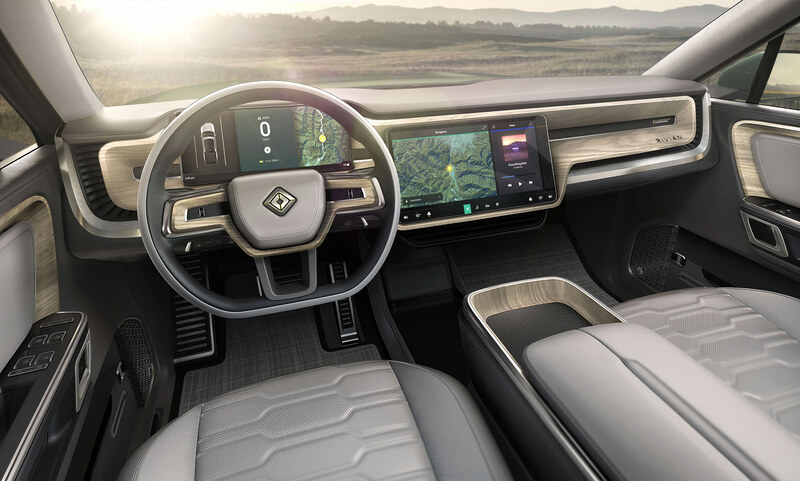 Rivian intends to start production and deliveries in 2020, starting with the highest luxury variants and the lowest battery pack variant estimated to be available in 2021. As seen in the unveil video above RJ Scaringe describes that the vehicle even has ‘easter eggs’, like an integrated spot for an emergency torch in the front doors (another idea surely inspired by Tesla/Elon Musk, not a bad thing at all). Talking about inspirations from Tesla, the 15″ center touchscreen and a huge 12″ instrument panel are standard on both R1T pickup truck and the R1S SUV. RJ Scaringe also hinted that Rivian is working on their own ‘Self Driving Software’ and other driver-assist technology of which the details are scarce at the moment, also the pricing of the vehicle or features is not yet disclosed — although the electric automaker is taking reservations for both of the vehicles for a $1,000 deposit online through their website. Although Rivian CEO talked about the ‘Gear Tunnel’ for the R1S SUV in the unveil event talk, the hosts did not give a demonstration for the R1S of this innovative and unique cargo space that was shown for the R1T pickup truck EV. 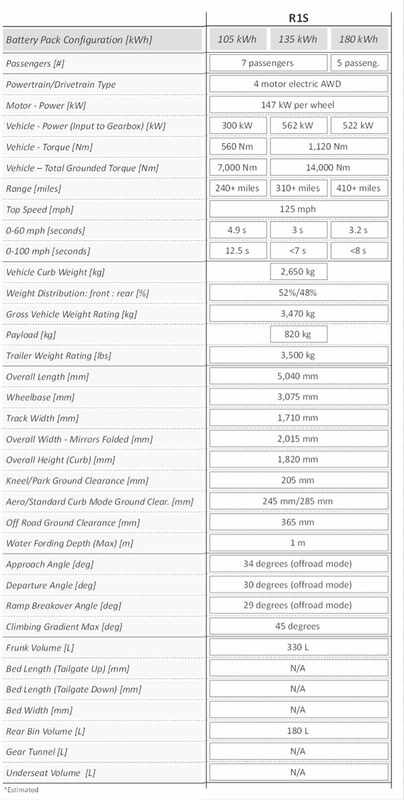 Rivian electric vehicles are developed on their proprietary ‘Skateboard Platform’ which according to Rivian allows their vehicles to adequately fit the battery pack, drive units, suspension, braking, and thermal system all below the height of the wheel, resulting in sufficient passenger and cargo space (see figure above). 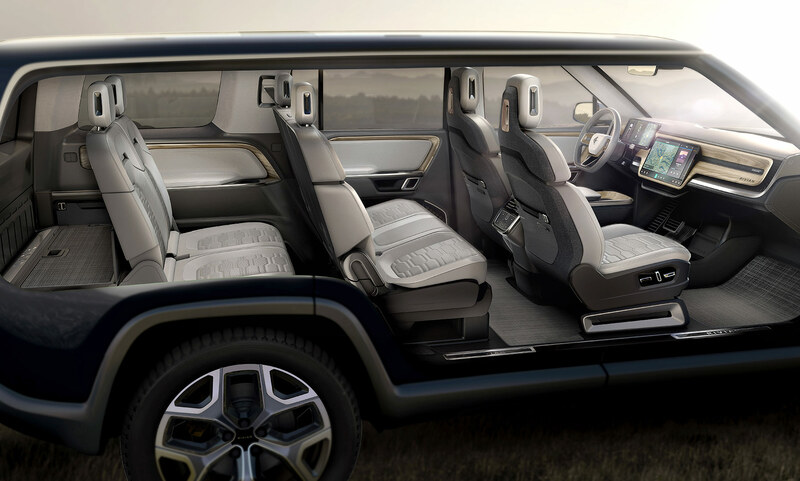 Both 2nd and 3rd-row seats of the Rivian R1S SUV can be folded down to create a huge boot-space if needed. Rivian says their luxury electric SUV is made for the adventurers, campers, and enthusiastic travelers that hate polluting the environment with gas emissions. 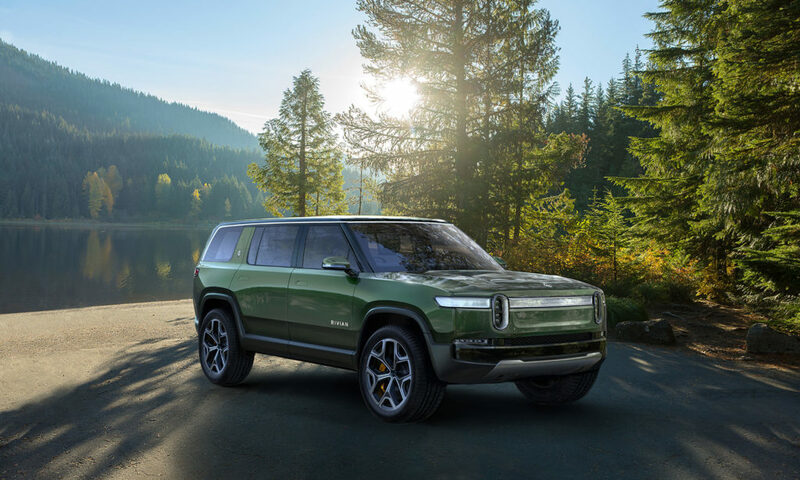 Industry experts think that with the R1S electric SUV, Rivian is going to give a tough time to Land Rover in the off-road automotive markets — let us know what your thoughts on this scenario in the comments section below.